In our family Easter is the holiday with the most family traditions. I figure that’s probably because we aren’t rushing around sorting presents and feast food like at Christmas and we don’t have to sort costumes and parties like at Halloween. I was over at my friend Imen’s (I married an Irish Farmer) the other day for an egg painting party with the daughters. It was a revelation to the Irish and English moms there that you can paint/color hardboiled eggs which is something we of american extraction assume everyone knows and does. My feeble crayon and foodcoloring on brown eggs attempts were shown up by Imen’s beautiful white eggs, american egg dyes, stickers, gold leaf and beads. I’m going to have to seriously up my game this year. 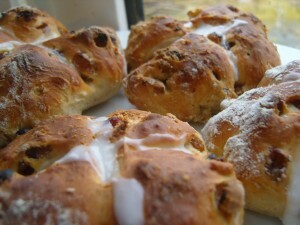 Easter here starts at 7.30 Good Friday morning when I get up and put on the dough for the hot cross buns. This is the only day of the year I get up that early to bake. Then the phone call comes at 9 from Dad asking are the buns ready, so I tramp down to the castle with hot Hot Cross Buns dripping with icing as I was too impatient to let the buns cool. 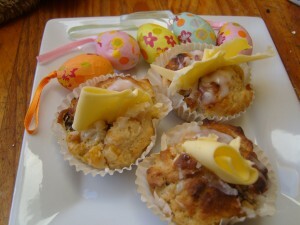 We then feast on buns and coffee down there (my kids don’t love hot cross buns so most of them go down to the parents). Next is the buying of dozens of eggs on saturday afternoon and the hardboiling of them saturday evening. Half get painted and left out for the Easter Bunny to hide and the other half get sent to mom who we have begged to make Finnish Easter Breads. 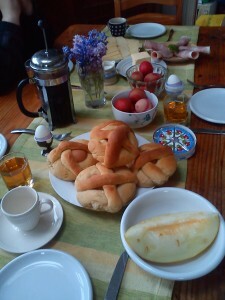 These are our traditional easter breakfast (my Granny being Finnish an all). Hard boiled eggs are baked into a sweet enriched yeast dough basket and eaten sunday morning with lots of ham and cheeses.Its not Easter without them. The painted eggs get hidden by the easter bunny around the house -usually just before kids get up as we have learned that if you hide those and the chocolate eggs earlier, dogs and cats find them and eat them and then you have sad children and sick animals. 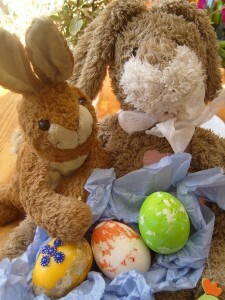 The kids also leave out their easter baskets which get filled with small chocolate eggs, flower and veg seeds, eggcups (we’ve quite a collection now) , coloring pencils, chocolate money and small stuffed toys (bunnies and chicks). The easter bunny does not give big eggs here as thats just too much chocolate. We are all stuffed still from breakfast so about lunchtime we trek down to Mom and Dads for “THE GREAT GIN RUMMY TOURNAMENT”. This is our favorite tradition. As much of the family as possible gets together and plays about 20 games of Gin Rummy then the scores are totted up. Mom buys a range of Easter eggs from super fancy Lily O’ Brien eggs down to a crappy chocolate flavoured egg. Then the winner picks first, then runner up and so on . The last egg left is usually fairly nasty. One year it was candy Refreshers egg. But my brother Ed says it has to be a nasty egg, if you are a loser you need to know it and it will inspire you to improve, and indeed it does. The brother in law went from winning the Refreshers egg with the lowest score ever seen in our house to Top Dog -claiming the Lily O Brien in the space of one year. He spends a few weeks every summer in Armenia mapping some caves there with a bunch of anthropologists, archaologists and other palentologists. They live in tents and have nothing to do in the evenings but play cards. A few weeks of playing gin rummy against Chess Grandmasters means you never need to worry about getting the crappy egg again. I woke up this morning with a hot cross bun craving but with a reluctance to actually make a yeast dough and wait for them to be ready. Then a lightbulb moment. Take the elements that make a hot cross bun and stick them into the fastest bread product to make – a muffin. 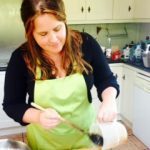 The elements I consider fundamental to a Hot Cross Bun are Mixed Spice (beloved flavouring of old Irish ladies), candied or mixed peel and raisins or currants. We used raisins as we have our own from our grapevine in the Polytunnel. We took our basic muffin recipe from the Better Homes and Gardens New Cookbook and added these elements and voila- yummy hot cross bun muffins in a fraction of the time to make real buns. Combine the dry ingredients in abowl and make a well in the center. In another bowl mix the egg,milk and oil togetherand then add to the dry ingredients.NB mix until just combined. The batter should still be lumpy If you over mix you get a dense, nasty muffin. Put into baking cases and cook for around 15- 20 mins until golden at 200 degrees. Let cool on a wire tray for a few minutes then make a cross on the top of the muffin using icing sugar and water or orange juice and water. Serve with lashings of butter. The girls made these for me this morning and we ate the pretty ones before we got a picture taken but you get the general idea. The girls also like these a lot better than Hot Cross Buns so I never need to get up and make buns again. Yay.